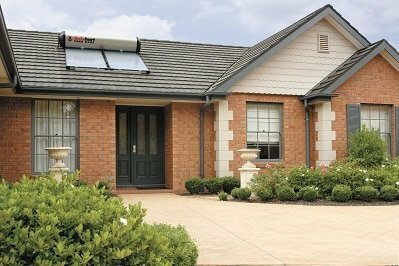 Solar hot water systems utilise roof mounted collectors to harness the sun’s energy. Once the water is heated in either solar panels or evacuated tubes, the water is then stored in a storage tank. Depending on the system type, tanks can be located either on a roof or at ground level. Solar heating produces energy savings and can often be far more efficient than gas or electric water heaters. The two main types of solar hot water heaters are Split system solar and close coupled. At Conrad Martens Plumbing and Hot Water we service, we maintain and repair a wide range of solar hot water brands, including Rheem, Chromagen, Edwards and Solarhart. Designed with the solar collectors located on the roof and the storage tank located at ground level. In most circumstances this setup will remove the need for an engineer to inspect your house and decide if your roofs structure is suitable for the heavyweight of a close coupled system heater. A control box and PCB is used to read temperature sensors wired into the storage tank and collectors. This will turn a small water circulation pump on and off as heating is required. This process can sometimes become problematic as the system ages and parts may require replacement. If you experience problems in this area you may be able to conduct an easy test to narrow down the cause of the problem. Unplug the circulation pump from the control box and plug it into a powerpoint the pump should start running. If it does then control box may require attention from a licenced solar hot water plumber. These systems also have a back-up electrical heating element which can be switched on when extended periods of cloudy or rainy weather is experienced. Both the solar collector panels and storage tank located on the roof. If you have never had a solar hot water system installed on your roof it is important to contact an engineer. They will be able to guide you on whether your current roof structure is suitable for the extra weight of a close coupled system. These systems do not have a pump attached. They rely on the thermosiphon process of cooler water moving down through copper pipes in the collector panels and being heated. The heated water then moves back into a storage tank located above the collectors. This process continues until the entire storage tank is heated. Generally, maintenance costs on these systems will be low as there are few moving parts and the designs are simplistic. Typically issues with these systems relate to associated valves. Poor water pressure as a result of a failed pressure limiting valve. Relief valves failing to shut off after system has heated and Tempering valves failing to allow hot water through to bathrooms. Close coupled systems also have a back-up electrical heating element. This can be used during cloudy or wet weather when solar gain is low and will provide hot water until the sunny weather returns. Our hot water specialists can service and carry out general hot water system repairs to most models of solar water heaters. If your old solar hot water system has failed and requires replacing, we can assist you with identifying a replacement model that suits your needs and budget. Alternative options could also be available that may be more cost effective or energy efficient for water heating in your home. The Australian government has also recently released the renewable energy scheme. This scheme may benefit those who choose to have a solar energy water heater system installed. Call us now for advice and same day solar hot water repairs across Brisbane and surrounding areas.